The former senior intelligence officer declared the metal detritus inside the crater was staged. Pierre Sprey, an aeronautical engineer who spent many years at the Department of Defense as a weapons analyst, also doubted that the scene at the crater was genuine. Sprey agreed that intact pieces of the weapon should have been found. “Without a shadow of a doubt you would have found the tail fins and nose cone,” said Sprey. Not a single recognizable fragment of a weapon that could have delivered sarin gas was ever displayed in videos or photographs taken by the White Helmets or Syrian rebel media activists in Khan Sheikhoun. Ole Solvang, the main author of the Human Rights Watch report on Khan Sheikhoun published May 1, acknowledged in an interview that he had asked all the personnel of the White Helmets civil defense organization and other witnesses interviewed by his organization whether they had seen any other parts of a weapon. All responded in the negative. (The White Helmets is a Western and Gulf-funded arm of the Syrian insurgency that is primarily responsible for influencing foreign news media and opinion on behalf of the Syrian armed opposition). Chunks of asphalt would also have been strewn around the crater by an airstrike. “Debris would be blown several meters away from the crater,” Gilbert noted in an interview. But independent Berlin-based forensic researcher Michael Kobs discovered footage suggesting no debris was on the road near the crater after that morning. Hersh reported that the building hit in the airstrike had been under surveillance by a Russian drone for days, and that intercepted communications had indicated that a meeting involving senior officials of Ahrar al Sham and al Qaeda was supposed to be held there on April 4. Other evidence indicates that the building that was destroyed was indeed the one that had targeted by Syrian intelligence, but that the inhabitants were linked to the opposition government, but not to military or political decisions. The widow of a former detainee told researchers for the NGO report that she had rented one floor of that two-story building to a family from Hama province, and that the father had been killed and seven member of the family had been injured. The list of victims appended to that NGO report shows (#72-80) that Amer Nayf al Nayef from Hama province and eight members of his family—the only victims on the list not from Khan Sheikhoun itself – had all died that day. Last September Syrian Voice, a news website with contacts in the opposition, identified Amer Nayef as the head of the Hama Province Council’s relief office. An offensive led by al Qaeda and Ahrar al Sham that had begun in Hama province to which the government responded with airstrikes had displaced thousands of rural people. Nayef told Syrian Voice that he was looking for housing for the displaced in other areas. Obviously Nayef moved to Khan Sheikhoun to work on that resettlement. The Russians at Shayrat airbase who were in touch with U.S. officials at the Al-Udeid airbase in Qatar via the “deconfliction line” said the intelligence had also found evidence of weapons and goods required by the population, including “insecticides to protect crops” being stored in the basement of the building, according to Hersh’s report. What apparently concerned Syrian intelligence the most was information that supplies of aluminum phosphide, commonly used as a fumigant to protect grain from rodents, were stored there. When this chemical is exposed to moisture, however, aluminum phosphide produces deadly phosphine gas, which can in turn be used as a chemical weapon. The Syrian suspicions about al Qaeda’s forces using a phosphine-based chemical weapon were not completely unfounded. In mid-2015 Islamic State troops in Syria had fired shells at Kurdish forces that were found by a private research organization to have contained phosphine gas. In spring 2016, a terrorism intelligence website had reported that a password-protected pro-Islamic State and pro al-Qaeda internet forum had started a thread on how to produce phosphine gas for improvised explosive devices. In November 2016, a Syrian airstrike had destroyed part of a warehouse close to Khan Sheikhoun’s grain silos, and after driving rebels troops out of Aleppo, Russian forces had discovered an assortment of what were regarded as potential chemical weapons in a former school, including bags of aluminum phosphide. The Syrians and Russians were on the lookout that any evidence that aluminum phosphide was being stored somewhere in the city. But the aluminum phosphide stored in the house Nayef’ had rented was very likely part of the resettlement work he was doing in the Khan Sheikhoun area. Although it is possible that the house was also to be used for political meetings, the aluminum phosphide was almost certainly for agricultural use. This background to the strike raises serious questions about Russian and Srian intelligence really knew about the target and whether they were aware that a conventional airstrike on supplies of aluminum phosphide carried the risk of mass casualties from phosphine gas. The initial Russian-Syrian account of the event also distracted attention from the real Syrian airstrike in Khan Sheikhoun and the question of what they anticipated would be the consequences of bombing supplies of aluminum phosphide. But any effort to hold them accountable for that actual strike only came when Western governments acknowledge that the alleged sarin attack on Khan Sheikhoun was a fiction. “If you injected IMPA into people whom you then present as victims, you would indeed find it in the urine,” one scientist who has worked closely with OPCW said in an email. Neither of the scientists contested the fact that the test for IMPA in urine samples could have produced false positives. Phosphine’s intermediaries would have such an effect by binding to enzymes that regulate nervous system transmission, Potter said. And that effect could have been reflected in OPCW laboratory tests of victims of phosphine exposure, according to Potter. The OPCW report cited the fact that the Syrian government had provided a series of environmental samples as evidence, and even suggested that the government did not question the OPCW’s overall conclusions. But the details of that data do not support the latter assertion. 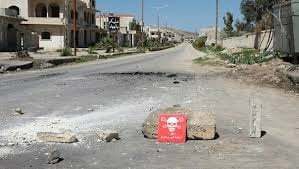 Although the samples from soil and metal objects in the crater said to have been taken on the Syrian government’s behalf and tested in its laboratories all registered as positive for sarin, those samples could have easily have been contaminated from the start with a few small vials of sarin. On the other hand, all but one of the 14 soil samples analyzed by the government laboratory outside the crater registered nothing of significance.